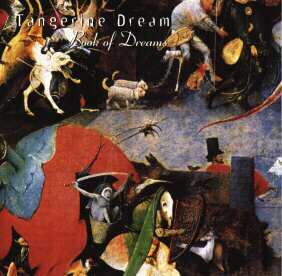 Book Of Dreams, released in late 1995, was not just another "Best Of" set but a surprising item with two aspects: The old music material had been reworked by Edgar Froese like he had done for Tangents one year before, and the cover artwork was something like a look forward to Edgar Froese's at that time planned project on Hieronymus Bosch, a Dutch painter (around 1450 - 1516) well known for creating surrealistic environments. The music material was taken from records in TD's Jive and Relativity back catalogue which had been bought by Castle Communications in autumn 1995. Especially the music from the early albums has been reworked with additional rhythm tracks and sound patterns. Some of them really sound surprising and alienated with the original tracks being used as background basic material only. On the other hand, only a few of the newer 'Blue Years' track have been reworked and come with additional sounds, but less strong than the older ones. The complete material of Book Of Dreams has later been re-released as part of the boxed set The Dream Roots Collection (1996).